Here are images to help you read the ‘pasted-paper’ essay by Clement Greenberg. Good luck! 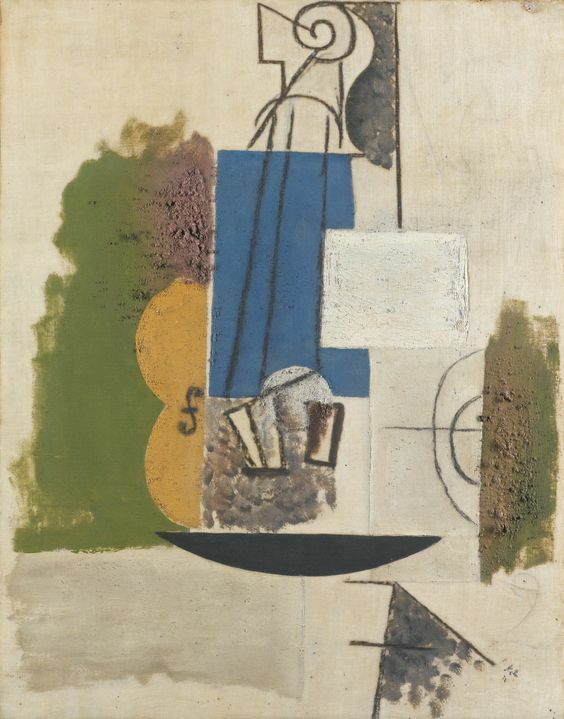 In 1910 Braque had already inserted a very graphic nail with a sharp cast shadow in a picture otherwise devoid of graphic definitions and cast shadows, Still-life with Violin and Palette, in order to interpose a kind of photographic space between the surface and the dimmer, fragile illusoriness of the Cubist space which the still-life itself – shown as a picture within a picture – inhabited. 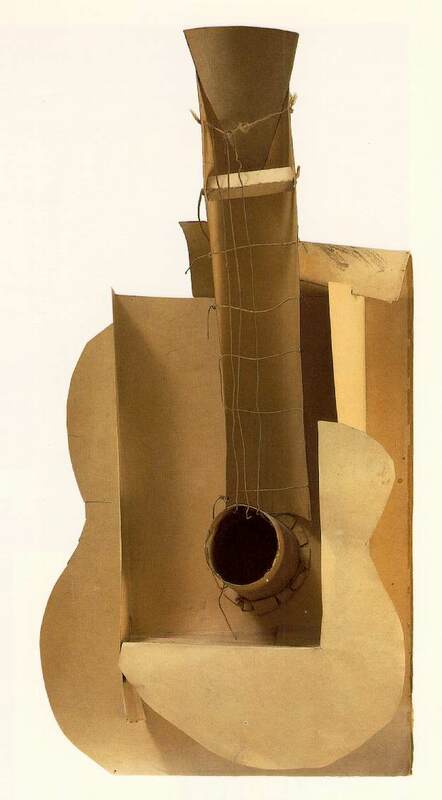 And something similar was obtained by the structural delineation of a loop of rope in the upper left margin of the Museum of Modern Art’s Man with a Guitar of 1911. 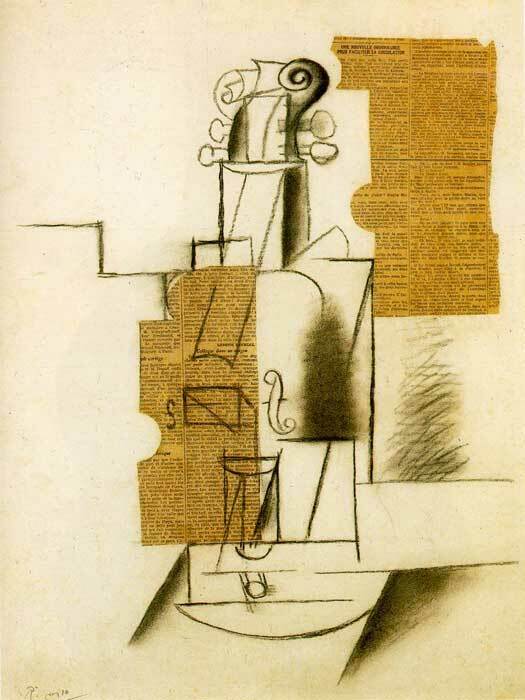 In that same year Braque introduced capital letters and numbers stenciled in trompe-l’oeil in paintings whose motifs offered no realistic excuse for their presence. 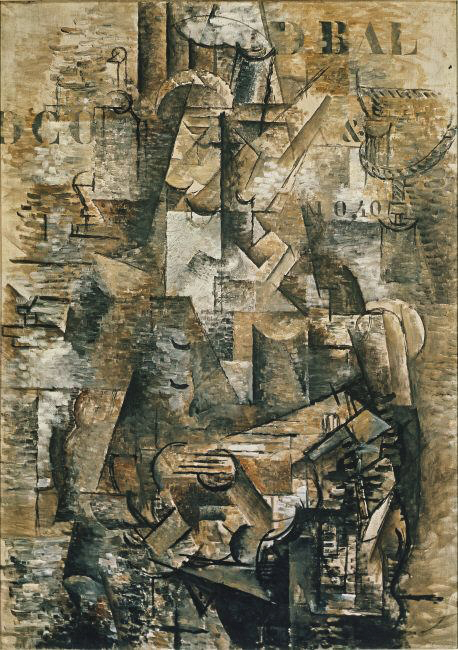 The intrusions, by their self-evident, extraneous and abrupt flatness, stopped the eye at the literal, physical surface of the canvas in the same way that the artist’s signature did; here it was no longer a questions of interposing a more vivid illusion of depth between surface and Cubist space, but one of specifying the very real flatness of the picture plan so that everything else shown on it would be pushed into illusioned space by force of contrast. 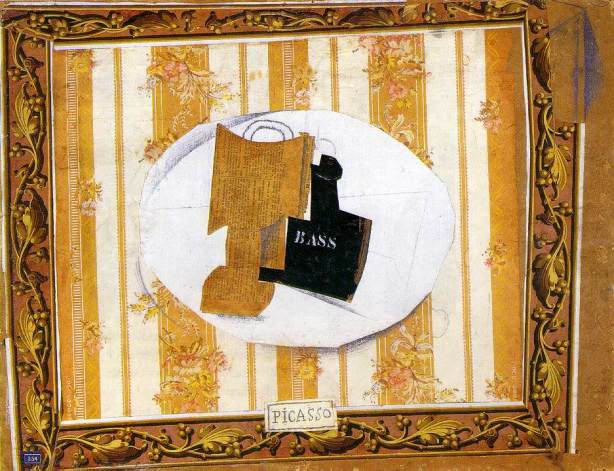 It was toward the same end the Picasso and Braque began, in 1912, to mix sand and other foreign substance with their paint; the granular surface achieved thereby called direct attention to the tactile reality of the picture. 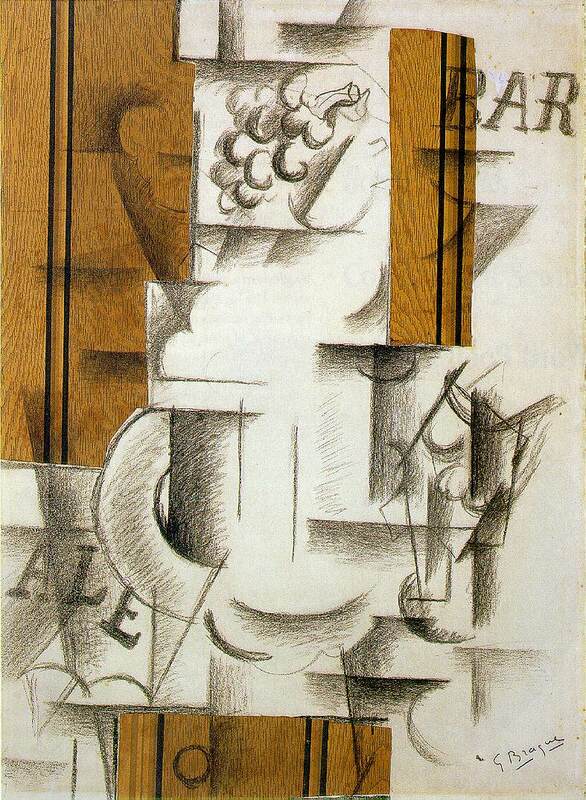 A little later [Braque] made his first collage, Fruit Bowl, by pasting three strips of imitation wood-grain wallpaper to a sheet of drawing paper on which he then charcoaled a rather simplified Cubist still-life and some trompe-l’oeil letters. Cubist space had by this time become even shallower, and the actual picture surface had to be identified more emphatically than before if the illusion was to be detached from it.. Now the corporeal presence of the wallpaper pushed the lettering itself into illusioned depth by force of contrast. . . . The strips, the lettering, the charcoal lines and the white paper begin to change places in depth with one another, and a process is set up in which every part of the picture takes its turn in occupying every plane, whether real or imagined, in it. The imaginary planes are all parallel to the one another; their effective connection lies in their common relation to the surface; wherever a form on one plane slants or extends into another it immediately spring forward. The flatness of the surface permeates the illusion, and the illusion itself reasserts the flatness. The effect is to fuse the illusion with the picture plane without the derogation of either — in principle. 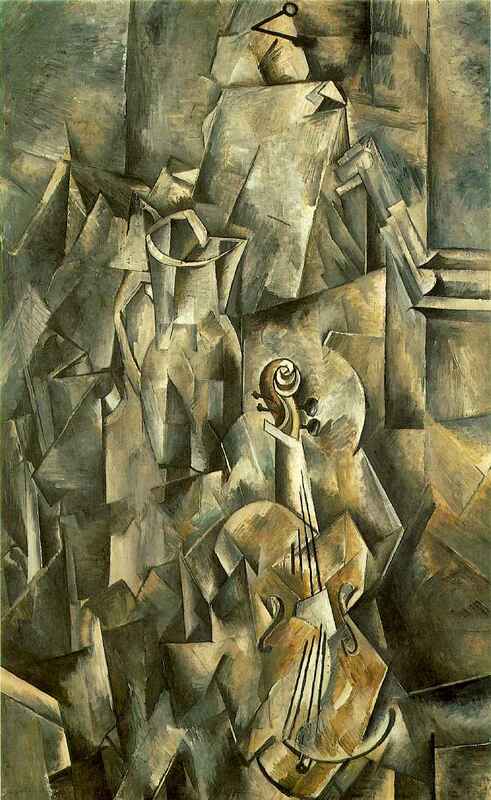 Cubism, in the hands of its inventors achieved a new, exalted and transfigured kind of decoration by reconstructing the flat picture surface with the very means of its denial. They started started with the illusion and arrived at a quasi-abstract literalness. 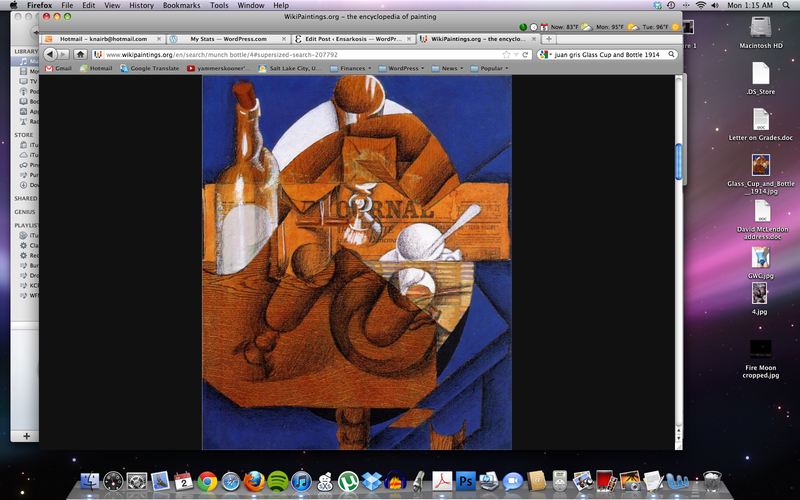 With [Juan] Gris it was the reverse. As he himself explained, he started with flat and abstract shapes to which he then fitted recognizable three-dimensional images. . . . He used his pasted papers and trompe-l’oeil textures and lettering to assert flatness all right; but he almost always sealed the flatness inside the illusion of depth by placing images rendered with sculptural vividness on the nearest plane of the picture, and often on the rearmost plane too. . . . Instead of the seamless fusion of the decorative with the spacial structure of illusion which we get with the collages of the other two masters, there is an alternation, a collocation, of the decorative and the illusion and if their relationship ever goes beyond that, it is more liable to be one of confusion rather than fusion. Gris’s collages have their merits, but they have been over-praised. That point, as I see it, was to restore and exalt decoration by building it, by endowing self-confessedly flat configurations with a pictorial content, an autonomy like that hitherto obtained through illusion alone. Elements essentially decorative in themselves were used not to adorn but to identify, locate, construct; and in being so used, to create works of art in which decorativeness was transcended or transfigured in a monumental unity. Monumental, in fact, is the one word is choose to describe Cubism’s preeminent quality.